In mid-1943, whilst the outcome of the Second World War was anything but known, the US government had exploratory talks on the future regulation of international civil air transport with representatives of allied nations; the outcome was that fifty five allied and neutral nations were invited to meet for discussions in Chicago from 1st November 1944. Fifty two nations attended and met for seven weeks. The final result was the drawing up of a Convention on International Civil Aviation (aka ‘The Chicago Convention’ sometimes found – even today – in the ‘small print’ of an airline’s passenger rules and regulations). It was agreed that thirty days after the governments of twenty six nations (i.e. half of the nations attending the Conference) ratified the Convention, the International Civil Aviation Organization (ICAO) would come into existence. Given the world war in progress and the number of governments attending the convention, it was obvious that ratification could take a considerable time, so it was agreed that a Provisional ICAO (PICAO) would function as from 1st August 1945. The existence of PICAO was limited to the period necessary to establish the permanent organization, or a lifetime of three years. Fortunately, on 5th March 1947, Spain became the twenty sixth government to sign, and ICAO came into existence thirty days later. Today, it is classified as an agency of the United Nations and is the controlling agency for all operational aspects of the international airline business. 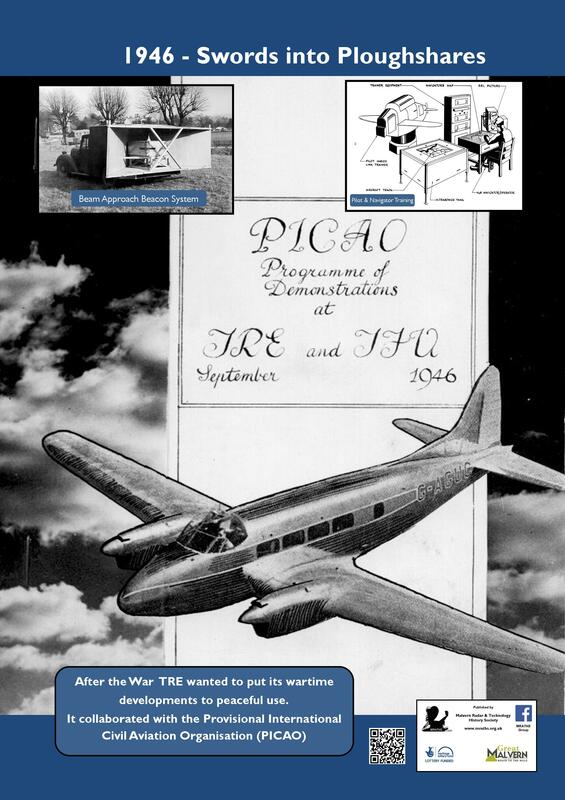 As a PICAO signatory having one of the acknowledged two top-level technology bases in the world at that time, the UK government organised a ‘Demonstration of Radio and Radar Aids to Civil Aviation’ on behalf of PICAO. The demonstration was centred at TRE and also at Royal Aircraft Establishment, Farnborough, in September 1946. USA, the other top-level technology nation, mounted its own demonstrations in USA. It was, of course, an opportunity to help re-establish the peacetime UK economy with income earned from exports. During the Second World War, TRE excelled in the design of electronic systems of many types (especially radar-based) for military aircraft – for navigation, to get bombers to their targets and safely back home, to designate targets, to aid landing at night or in bad weather, air traffic control, and even experimental automatic landing. The production of these systems, many of them in huge quantities, had turned the UK electronics industry from a domestic minnow into a major industrial force. Now that wartime production levels were no longer required, the industry needed new customers, and several of the systems designed for the RAF’s war effort were seen to have application world-wide in civil aviation. In the case of TRE, individual equipments were demonstrated working ‘on the bench’ in the Malvern laboratories, and also at Defford airfield where ‘live’ demonstrations using aircraft were given.